Kit Reed. The Food Farm. J.G. Ballard. The Cloud-Sculports of Coral D.
John Updike. During the Jurassic. Hilary Bailey. The Fall of Frenchy Steiner. Bob Shaw. Light of Other Days. Peter Tate. Beyond the Weeds. R.A. Lafferty. The Primary Education of the Camiroi. Sonya Dorman. When I Was Miss Dow. Thomas M. Disch. A Vacation on Earth. Charles L. Harness. An Ornament to his Profession. William Burroughs. They Do Not Always Remember. Fritz Leiber. The Winter Flies. J.G. Ballard. You : Coma : Marilyn Monroe. Henri Michaux. And More Changes Still. Gunter Grass. In the Egg. Samuel R. Delany. The Star-Pits. 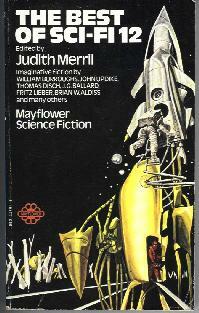 The book shown here as “The Best of Sci-Fi 12” (Mayflower) was first published in the U.S. as simply “SF 12,” not “Best SF 12”; I have the Delacorte hardcover and the corresponding Dell paperback as well. Merril’s afterword gives some justification/explanation about the reasons for changing the name of the series from the previous form “The __th Annual of the Year’s Best SF” – if not actual portents that this would be the last of them.